The American revolution in modernism in the mid-1900s was not confined to painting and sculpture alone (i.e., Abstract Expressionism). Aside from the New York School’s exploring the question of process over object, many schools of artists developed in the late 1940s that questioned the traditional concepts of various art forms. These groups included the ceramics-as-fine-art artists such as Peter Voulkos (1924–2002), and the fine woodworking movement that emerged in America during the post-World War II (1939–1945) period from coast to coast. James Prestini is considered one of the “fathers of the modern woodworking movement” in America. He was influenced by the work of his father, an Italian stonecutter, and by the Bauhaus aesthetic of applying the elements and principles of fine art to utilitarian objects. He obtained degrees in mechanical engineering from Yale, the University of Stockholm (where he was exposed to Scandanavian modernism of the 1930s), and the Illinois Institute of Technology in Chicago in 1939, a “Bauhaus West” of sorts where Bauhaus alumni Mies van der Rohe and Moholy-Nagy both taught. 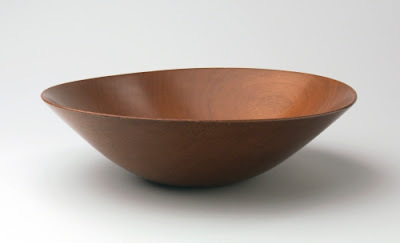 Between 1933 and 1953, Prestini produced hundreds of thin-walled, lathe-turned bowls in a variety of rich hardwoods. Part of the beauty of his work is the perfection of form in the simplest of terms. The refined surfaces of his pieces often mimic the finish of glass or ceramic. These pieces really do bring the beauty of art to everyday utility. Hap Sakwa, born in Los Angeles, was inspired at the Woodstock Music Festival in 1969 to become a decorative arts artist. In 1972 he settled in southern California where he was influenced by two major figures of the American Studio Furniture movement, Bob Stocksdale and Art Carpenter. 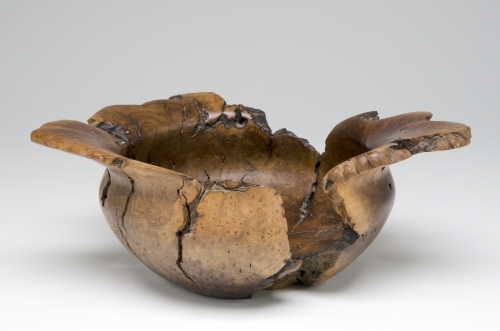 Sakwa began producing lathe-turned vessels and carved figurative sculpture from native California root burls. Like many of the artists of the American Studio Furniture movement, Sakwa’s designs walk a fine line between sculpture and utilitarian vessels. 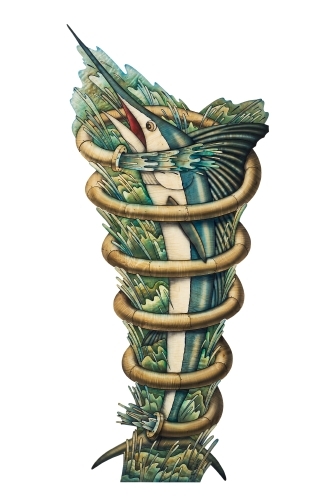 In 1977 the artist was featured in an early issue of Fine Woodworking Magazine. One of the major schools of modern woodworking is Northern California that emerged during the late 1940s. These artists came from many fine arts colleges in California, many of them specializing in hand-made furniture with a modern aesthetic produced in fine woods. These early artists extended the range of fine woodworking to encompass not only other utilitarian art objects, but also fine art. William Hunter is a sculptor who creates organic forms in lathe-turned wood. With degrees as varied as an AA in Fire Science and a BA in Sociology, Hunter was a self-taught woodworking artist. His first show of his turned works was in 1970, at the height of the fine art woodworking movement. His sculpture uses the vessel—one of humanity’s oldest forms—as his vehicle of expression. Hunter’s lathe-turned forms—subtractive sculpture—emulate organic growth without depicting a particular plant or shell, or a specific narrative. 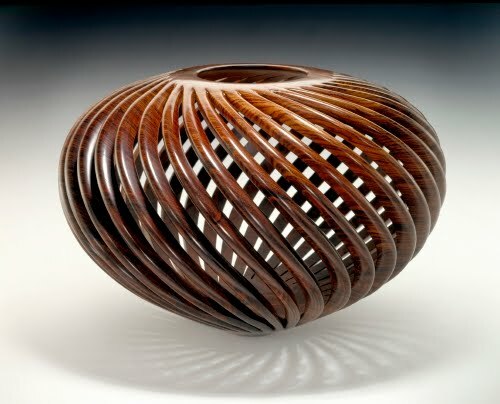 Born in Altadena, Cederquist is one of the many prominent artists of the California branch of the contemporary woodworking movement. He has a BA in art and an MA in crafts from California State University at Long Beach. Cederquist’s earliest involvement in the woodworking movement came in the design of furniture in the prevailing aesthetic of the 1970s, which emphasized anthropomorphic forms that stressed the qualities of the wood. This early furniture was heavily influenced by Wendell Castle. By the late 1980s, however, fascinated by the ideas of perspective and the illusion of depth on a two-dimensional surface, he began to explore trompe-l’oeil imagery in the context of furniture and wooden assemblages. This chest of drawers is a great example of his trompe-l’oeil work. Born in Emporia, Kansas, Castle earned a BFA in sculpture and an MFA in industrial design from the University of Kansas. He taught at the Rochester Institute of Technology (1962–1969) and then opened the Wendell Castle School in 1980. This school, now incorporated into the furniture making program at RIT, was a non-profit education institution offering instruction in fine art woodworking and furniture design. Castle has been at the forefront of innovative contemporary American furniture design for more than five decades. His works are characterized by organic forms from nature that Castle believes are a natural source for furniture design. 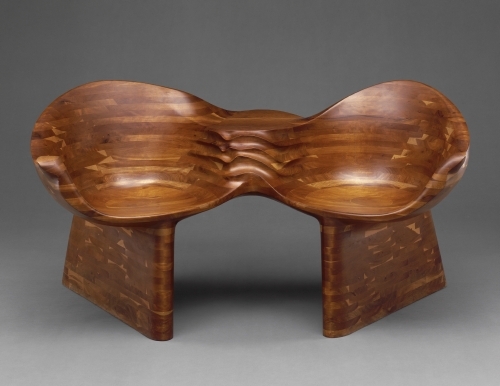 As a pioneer of the American Studio Furniture movement, he pioneered a sculpture technique of laminated, stacked wood which he then carved into organic forms. He has also pioneered a process of carving fiberglass to make furniture.